Now you can reduce your overall communications costs, streamline business processes, and make employees more productive, How? With Polycom voice solutions and Skype for Business. 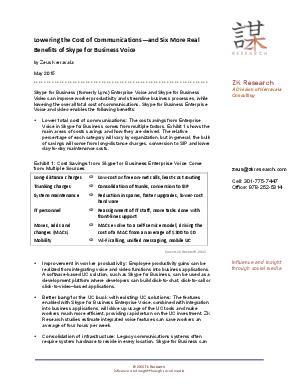 The brief by ZK Research, Lowering the Cost of Communications—and Six More Real Benefits of Skype for Business Voice details how you can improve staff productivity, leverage existing UC solutions, consolidate infrastructure, get to market quicker, support BYOD, and pave the way for video. All while dramatically lowering your total cost of communications.